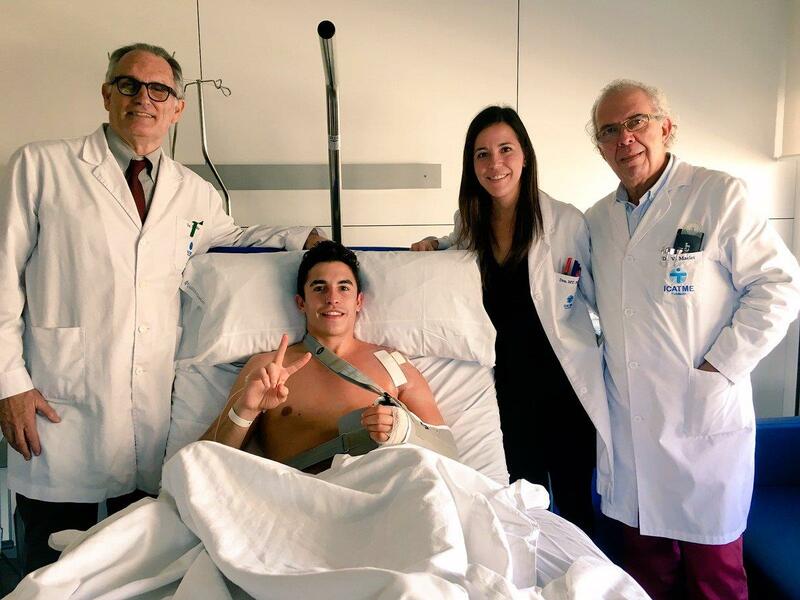 Marc Marquez has undergone successful surgery on his damaged left shoulder, with MotoGP medic Doctor Xavier Mir operating to fix the injury that has plagued the world champion in the second half of the season. First sustaining damage to the joint back in 2013 when he crashed at the British Grand Prix, the injury has been exacerbated throughout this season to the point of needing surgery. Damaging the joint in his shoulder so that it became easy to dislocate at any time, it most famously occurred when Aprilia rider Scott Redding gave him a celebratory hug only seconds after Marquez won his seventh world title at Motegi. But, with an expected recovery time of up to six weeks for the delicate operation that involved grafting in a small piece of bone, Marquez waited until the end of the season before going under the knife. Having the operation last Tuesday, he says that he’s confident that he’ll be back to full fitness by the time the first test of 2019 comes around in early February. The operation comes as one of a series planned by the MotoGP grid now the season has ended, with Jorge Lorenzo and Aleix Espargaro among others planning or already undergoing minor operations to help clear up niggling injuries picked up during the season. A more intense schedule than ever, with nineteen races and no summer break, has meant that there’s a longer list than ever of riders needing time to heal up while the testing ban is in place.